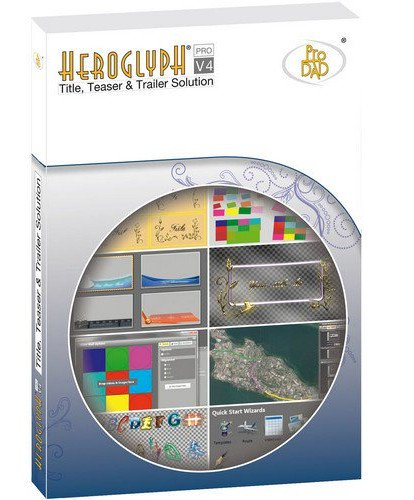 ProDAD Heroglyph 4 The Essential Video Titler Solution. You are searching for a powerful yet easy to handle titling-tool to turn your your creative ideas into reality? Dive into the wealth of new, creative possibilities of Heroglyph V4. Create professional video titles, lower-thirds, credits, travel routes and handwriting animation with only one amazing tool. Add the perfect finishing touch to all of your projects. Endless combinations of effects, animations, and unique fonts for professional results and are easier to create than ever before. It's your choice! Heroglyph V4 integrates seamlessly as a plug-in with NLE's by Adobe�, AVID�, Corel�, Grass Valley�, Magix, and Sony� (32-bit & 64-bit plug-ins available) or you just use Heroglyph V4 as stand-alone application.